The President, Shri Pranab Mukherjee presenting the Standard to Armoured Corps Centre and School Ahmednagar, at Ahmednagar, Maharashtra on April 15, 2017. New Delhi: The President of India, Shri Pranab Mukherjee awarded Standards to Armoured Corps Centre and School Ahmednagar today (April 15, 2017). Speaking on the occasion, the President said that any nation draws it strength from all elements of National Power, and the capabilities of its Armed Forces are a major source of National power. Although we are a peace loving Nation, we will use all instruments of National power in order to protect our sovereignty. He was confident that our brave soldiers will rise to the occasion, as they have done so in the past, to meet the challenges and emerge victorious. 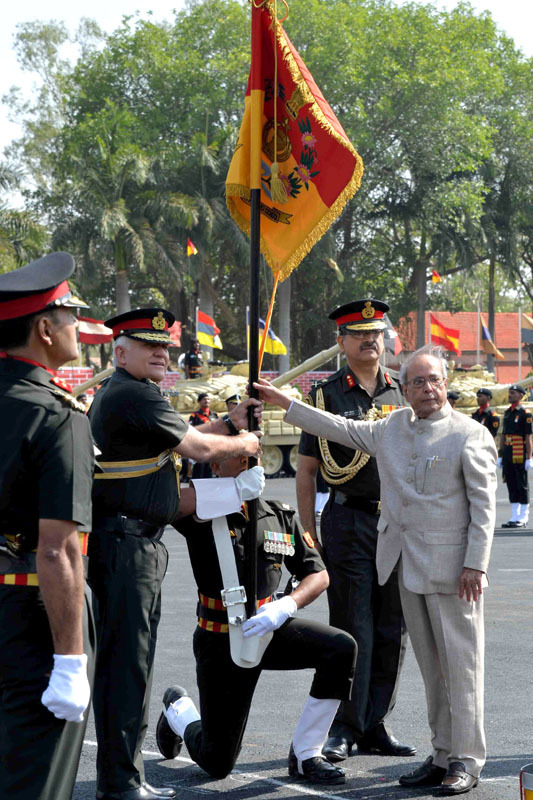 The President complimented the brave men of the Armoured Corps Centre and School for their impeccable turnout and outstanding precision in the parade they displayed today. This distinguished Establishment has a glorious past and rich tradition of professionalism and excellence in imparting training to the men of the Armoured Corps, the Indian Army and Friendly Foreign Countries. Since its inception in 1948, the Armoured Corps Centre and School has distinguished itself in service of the nation. In recognition of its selfless devotion, professionalism and dedication to service the nation honours it today, with a deep sense of gratitude and appreciation.